Quite frankly, the only thing that induced me to open the covers of this book was the fact that I'd never heard of it. Neither had any other Australians I mentioned it to. Yet my husband remembered it as a highlight of his Uni World Lit class. This gave me pause. Uni students in America were required to read a memoir of life in Australia by someone I'd never heard of? And my husband actually liked it? I found this to be a riveting memoir. Jill Ker Conway (born in 1934) is the engaging kind of memoirist who makes her life really interesting to readers...without being the annoying kind of memoirist who comes across as being endlessly fascinating to herself (a feat, since a lot of us secretly find ourselves fascinating, don't you think?). 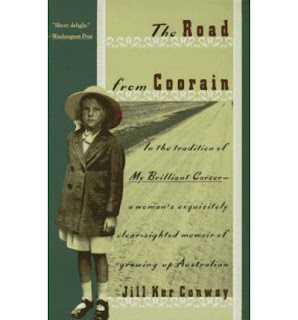 While the book jacket wants us to think that it is a portrait of Jill's bush childhood, it is, in essence, a memoir about the events which shaped Jill's decision to leave two great loves: her native country, and her mother. I wonder if this lies at the heart of why the book has not taken off in Australia in the same way it has internationally. Australia can be ambivalent towards its distinguished ex-pats. We love that they have the goods to really make it out there in the world, but we tend to be suspicious of their authenticity as a result. But don't let me turn you off reading the book. This is not a depressing or self-pitying memoir at all. This is the story of a young girl whose "feminist" mother tried to abort her (two planned sons were enough), but who became the life and hope of her family: the one who cared for the farm while also achieving the educational goals her parents had dreamed of for their sons - long after they had abandoned those dreams in the wake of devastating tragedies. This is a girl who took up the notion of duty with teeth-grinding seriousness despite the imperfections of her family and who kept a sense of wonder and excitement in learning about the world despite the many disillusionments of academia. "The routines governing time were also puzzling. One just began studying one subject after everyone had been induced to sit still and be quiet, and suddenly a bell rang, the teacher departed, and we rushed in the gymnasium for an activity called physical exercise. This I could not fathom. I knew how to do hard physical labor, but I was bored by the calisthenics and too clumsy to play the games. The purpose of all the activity was clear to everyone but me, and no explanations were ever given... Our parents had taught us to be the best at everything we did, but the things we were supposed to excel in had always before had some practical purpose." Her later discovery of how to make her university environment serve rather than squelch her love of knowledge is very interesting. "It was clear that I had to learn more about medieval Christianity because it had produced a world more beautiful than any I had ever seen." Understanding the tragedy of her mother — Jill wants to find a way to understand her mother's "descent into hell" (my husband and I have used this phrase ever since reading Charles Williams' novel of the same name). She senses that something larger than just their individual family situation has worked towards the demise of her mother's character. To her credit, she refuses to jejunely throw the blame on Men, or a Repressive Society. Christians will find ample basis in our common fallen condition (based on a historic space-time Fall) for the kind of disintegration she describes. "My schooling had been supposed to be training an elite for leadership, but it had really been training me to imitate the ways and manners of the English upper class. To talk of Australian elites was to realise that the people I and my brothers had known in school were working not on Australia's social and political problems, but on gaining recognition from an external British world. ... My friends on the left were no different. They were hostages to the worldview of the British working class... Australia was different." In the end, an unwillingness to fit into this dominant intellectual grid of 1950s Sydney - in which each camp romanticises/absolutises different aspects of British society - leads to Jill's decision to leave Australia to study History in America. "I realised that my plans to write a new kind of Australian history couldn't be fulfilled at the University of Sydney... I didn't want to join my radical friends in railing against a heedless society. I didn't want to write old-style institutional history of the British Empire and Commonwealth. ...the Harvard History Department...seemed to know how to explain the development of a new culture, and I was ready to learn from them." I'd recommend this beautifully-written book for people who just really like memoirs, or those who are interested in reading the reflections of an intelligent woman who grapples with the questions of Australia's culture and history and doesn't settle for easy answers. Thanks for the review, I'm going to read this...for both the reasons you have recommended it!